I haven't produced a piece of art in three years...until now. 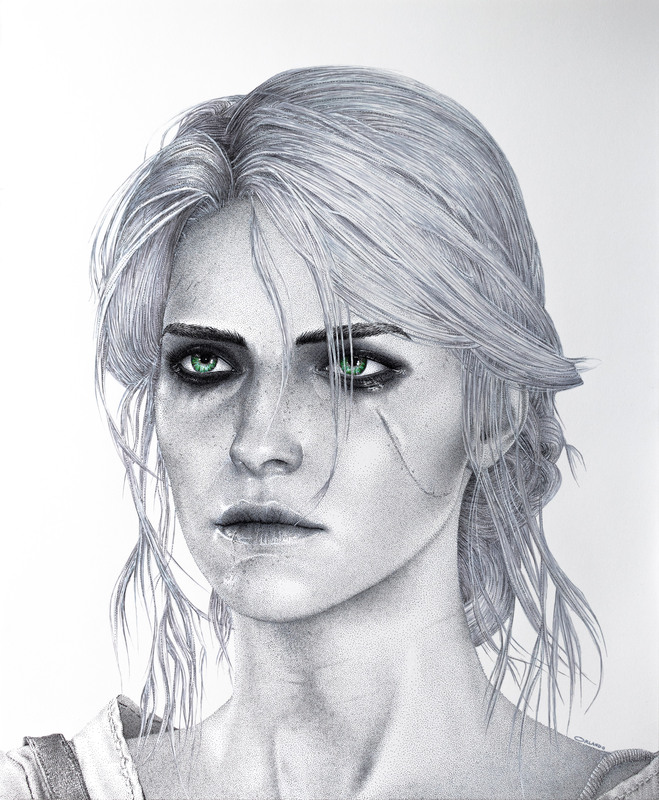 This is Ciri from one of my favorite RPGs, The Witcher 3: Wild Hunt. I used pen with a variety of stroke sizes, ranging from 0.2 mm to 0.8 mm. The hair was mostly drawn with a hatching technique, and the face, neck, and clothing with a stippling technique. 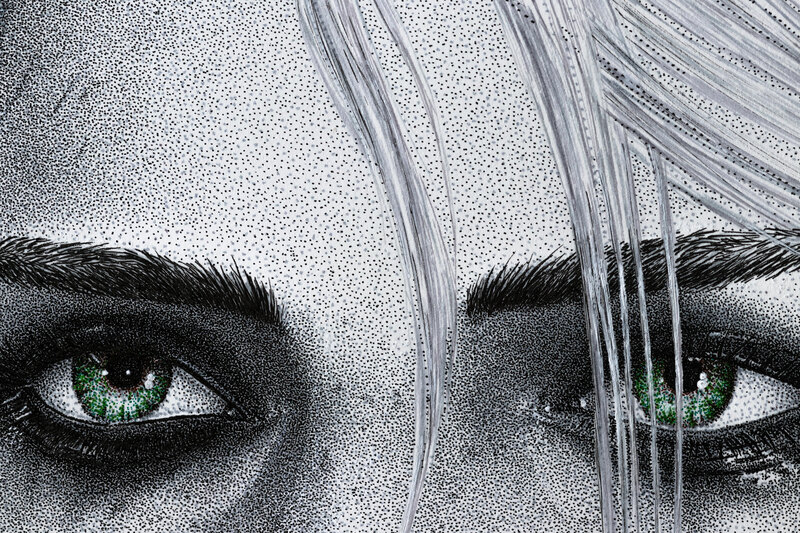 The only intentional color is the emerald green in her eyes, although some of the greys appear blue-ish. I considered coloring the scar red, but it would've taken too much attention away from the eyes. 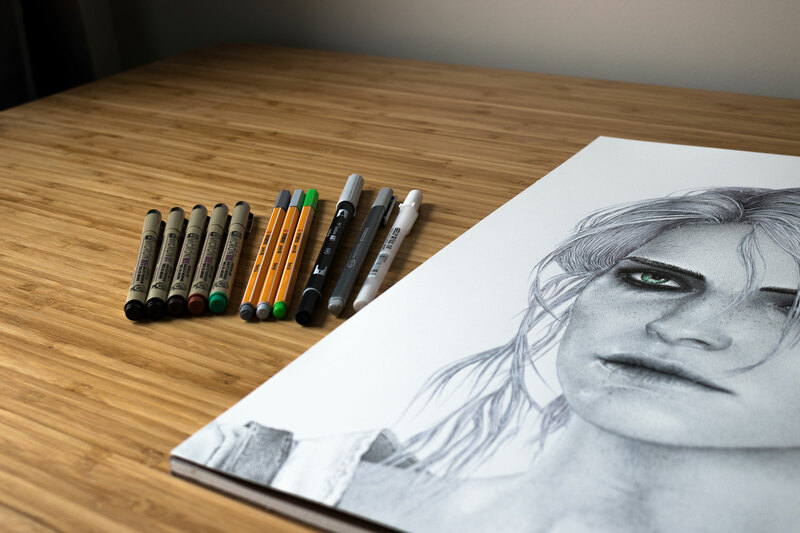 I didn't quite achieve a photorealistic look this time, but you can only get so far working off video game graphics. The stippling became more difficult as the density of the dots increased. A slightly misplaced dot starts to stand out more. You can see some of the freckles on her face use only slightly more compact dots compared to the surrounding area. Pretty tricky. I'm still learning how to use this technique effectively. One mistake I made was using the 0.2 mm black micron pen for the majority of the stippling—it's too small, so it takes longer to darken. I should've used the 0.25 mm for some of the darker areas of her face and neck. This was also my first time using 14" x 17" paper, so there was more ground to cover. I usually use 9" x 12". The white Gelly Roll pen was very useful for not only correcting small mistakes, but also highlighting parts of the eyes and hair. Maybe it was cheating a little bit...but hey, it still counts as pen, right? You can check out the full page on the drawing here. It has more photos and details on the media. In the future, I might try using a wider variety of colors the next time I use ink. I'm pleased with the black-and-white look, though. Definitely one of my finer (and more difficult) pieces to date. I'll end with a GIF showing the drawing's progress over time. Try to ignore the various lighting environments...and lens distortion.